Sergeant Bowen, 38, had completed his last mission during his scheduled deployment in Afghanistan and was awaiting his orders to return stateside when his commanding officer, new to the company and inexperienced, asked that Bowen stay to accompany his old unit one more time. Bowen readily volunteered. The Millersville, Maryland native was traveling back to base with his unit following the conclusion of combat operations on the last day of the ten-day mission when the vehicle in which he was riding struck a concealed Improvised Explosive Device. 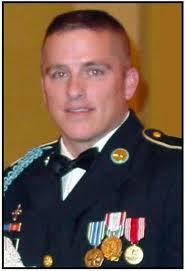 Two Americans were killed along with their Afghani interpreter and Sergeant Bowen was severely wounded. He was stabilized and flown to Brooke Army Medical Center in San Antonio, Texas where he had numerous surgeries to repair burns to over 50 percent of his body. Although he fought as valiantly for his life in the hospital as he did on the field of battle, Bowen ultimately succumbed to his injuries on March 14, 2008. Sgt. Bowen graduated from the University of Maryland with a degree in Computer Science in 2005. Having enlisted in the Maryland National Guard at the age of 18, it took Bowen several years longer to earn his degree than normal due to being called into active duty three times while enrolled as a student. He was, however, determined to finish his degree. Bowen was awarded the Bronze Star and Purple Heart medals, posthumously. His daughter is a Folds of Honor scholarship recipient.